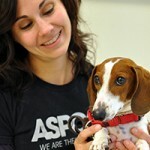 Dr. Katherine (Kat) Miller, Ph.D.
Dr. Kat Miller is Director of Anti-Cruelty Behavior Research at the ASPCA, and is a Certified Applied Animal Behaviorist and a Certified Professional Dog Trainer. She works with the Anti-Cruelty Behavior Team both in the field and at the ASPCA’s Behavioral Rehabilitation Center, working with special populations of animals including those rescued from puppy mills, dog-fighting rings, hoarding situations, and natural disasters. 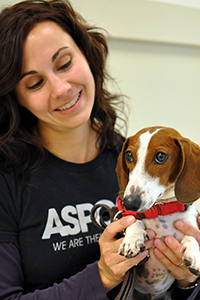 Her work involves addressing the behavioral needs of the animals while in the care of the ASPCA, including conducting behavior evaluations, providing environmental enrichment, and assisting in the rehabilitation of behaviorally challenged animals. Dr. Miller guides the Team’s research regarding the assessment, care, and rehabilitation of these animals. She also conducts outreach with the public and professional community to share current, science-based information on the behavior and welfare of companion and farmed animals. Dr. Miller received her Ph.D. in Animal Behavior from the University of California, Davis. Her research has been published in notable journals and has been presented at international conferences, and she is also quoted frequently in the media. She's also co-authored two book chapters on enrichment, one in the text Shelter Medicine for Veterinarians and Staff and one in press in Shelter Behavior for Veterinarians and Staff.